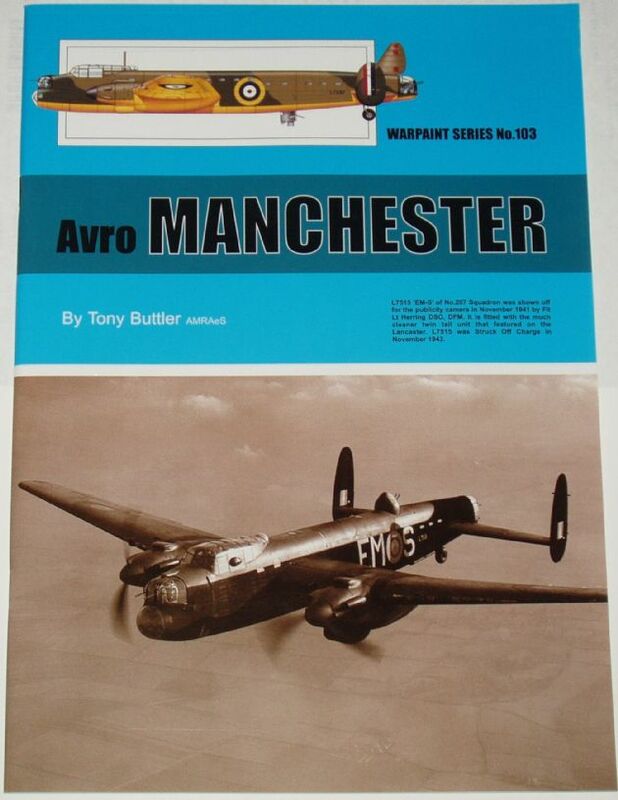 From the first page: The Avro Type 679 Manchester is considered to be one of the failures of British military aviation history and certainly the period oftime it spent in service with Bomber Command was not particularly happy. But it was an example of a new breed of bomber that included the Short Stirling, Handley Page Halifax and, later on, the Avro Lancaster which ultimately went on to turn the Command into an immensely destructive force during the last two years of the Second World War. The Manchester's origins go back to Specification P.13/36 of 1936. In fact two new bomber specifications were issued that year, B.12/36 for a heavy bomber (which in due course brought forth the Stirling) and P.13/36 for a new medium bomber (some Ministry documents also described this type as a heavy bomber). The war loads listed by P.13/36 were sixteen 2501b (1l3kg) or 500lb (227kg) or four 2,000lb (907kg) bombs but a limited number of aircraft might also have to carry two 18in (45.7cm) torpedoes. The maximum 8,000lb (3,629kg) load would require a catapult take-off and the aircraft's range had to be at least 2,000 miles (3,218km). The highest possible cruising speed was requested which at 15,000ft (4572m) had to be at least 275mph (442km1h). Defence weaponry would include nose and tail turrets mounting two and four machine guns respectively. P.13/36 was released to eight different companies for tender on 5 November 1936 and each submitted a proposal. At the Tender Design Conference held on 10 February 1937 Avro's Type 679 was placed first with the Handley Page H.P.56 second, both twin­engine machines to be powered by the Rolls­Royce Vulture. Two prototypes of each were ordered under Contract 624973/37 and 1 serials L7246 and L7247 were allocated to the Avro machines. In due course the H.P.56 project was abandoned and replaced by the four-engine Handley Page H.P.57 design which entered service as the Halifax. The book is illustrated throughout with lots of black and white photographs, as well as 8 pages of colour drawings showing individual profiles of aircraft with different designs and camoflauge.